A dental abscess is a type of bacterial infection that occurs with either the teeth, the gum tissue, or other area of the mouth. The precise medical definition of an abscess is: a localized collection of pus surrounded by inflamed tissue. This can occur with broken teeth, in cases of gum disease, with impacted wisdom teeth, and in many other situations. Treatment of the abscess by a dentist is necessary to prevent spread of the infection to areas beyond the oral cavity. Drs. Nicholas and Carla Calcaterra diagnose and treat these infections routinely in our office in Orange, CT.
A dental abscess with an infected tooth. This patient lived in West Haven, CT. Dr. Nicholas Calcaterra helped her by performing a root canal on the tooth. Photo by Dr. Calcaterra. 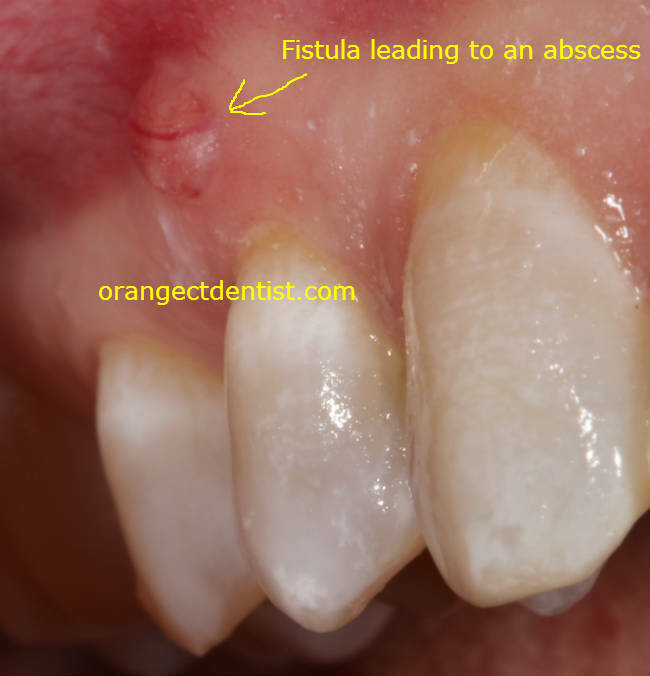 The above picture shows a fistula coming from an abscess. A fistula is simply a passageway or connection from one part of the body to another. In the above case, there is a collection of pus draining from the abscess through the fistula into the mouth. Sounds disgusting right? The patient above, who lived in West Haven, CT, had this occurring and was in pain. She came in as an emergency patient. Dr. Nicholas Calcaterra performed a root canal, curing the infection and resolving her pain. Two different dental abcesses on two different patients in extreme pain. Dr. Nicholas Calcaterra treated them immediately and resolved the pain and infection. Photos by Dr. Calcaterra. Wasn’t that satisfying? Here’s the direct link to the video as well. A broken tooth or a tooth with a large cavity in it. These teeth collect bacteria which enter into the bone surrounding the teeth and create an infection. Cases of severe gum disease. The bacteria enter the gums around the teeth and create an infection. This creates a special kind of dental abscess called a periodontal abscess. A foreign body such as a popcorn hull getting stuck under the gum tissue. 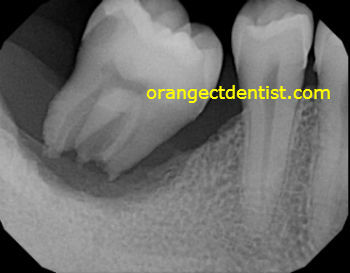 A developing and emerging wisdom tooth that is stuck under the gums (called an operculum) or adjacent tooth. Signs of an abscess can include pain, swelling, and redness in a particular area. Some patients will notice a fistula or “gum bubble” as seen in the above photograph. Some will also describe a metallic taste occasionally. A prescription for an antibiotic. A root canal procedure, assuming the abscess is from a tooth and that the tooth is not so broken down that a root canal will not be effective. Extraction of the offending tooth, either with local anesthesia or with IV sedation. Periodontal treatment due to advanced gum disease. Analysis of an offending wisdom tooth, with a possible removal of the wisdom tooth. Other treatment options specific to the diagnosis and your unique treatment needs. A dental abscess, like any other acute bacterial infection, is a serious and possibly life-threatening condition. If you believe you have one, call us for an appointment or visit our appointment page.